Store cards have improved, and many still offer discounts or deals. But a general card may be more rewarding long term. At NerdWallet, we adhere to strict standards of editorial integrity to help you make decisions with confidence. Many or all of the products featured here are from our partners. Here’s how we make money. Store credit cards can be tempting. Many offer immediate upfront discounts, as well as financing deals for large purchases such as appliances, electronics or home improvement supplies. Applying can feel like a slam dunk. But store credit cards aren’t always a good deal. The credit limits are lower than most other cards, so it’s easy to use a big percentage of your available credit during a routine shopping trip, which can bring your credit scores down. Their APRs tend to be higher, as well, meaning they can get expensive if you carry a balance month to month. Plus, the benefits are almost always confined to one store. Looking beyond the big box might yield you a better bargain in the long run. 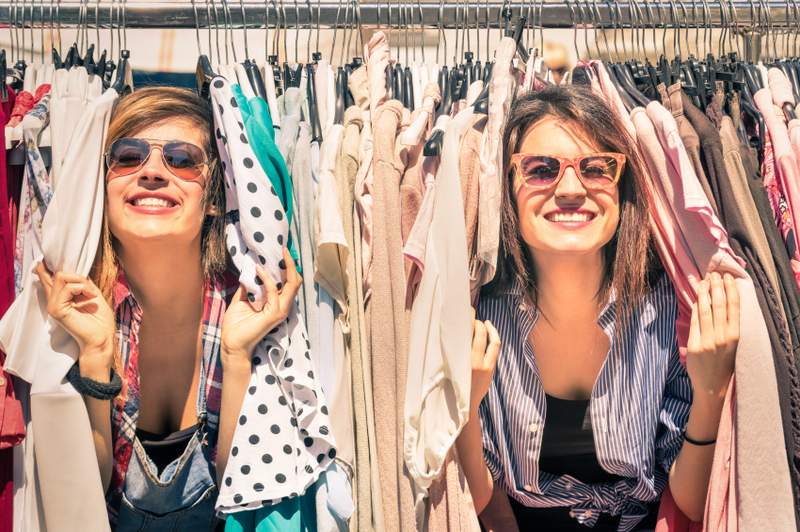 Here are some of our favorite options for retail shoppers. With the Citi® Double Cash Card – 18 month BT offer, your rewards aren’t limited to a single store that you visit only occasionally, or a single spending category that you rarely take advantage of. The card offers a high flat rate on all purchases, in the most flexible form of rewards: cash back. You’ll earn 2% back on everything: 1% when you buy, and 1% when you pay it back. The annual fee is $0. Alternative pick: If you want a flat-rate card with the potential to earn more in the first year, consider the HSBC Cash Rewards Mastercard® credit card. It offers a 3% introductory cash-back rate on up to $10,000 in spending. You’ll also earn unlimited 1.5% cash rewards on all purchases after that, plus a 10% anniversary bonus that pushes the card’s effective rewards rate to 3.3% in the first year on the first $10,000 in spending, and 1.65% thereafter. The annual fee is $0. And if you’re looking to finance a large purchase, the card offers an intro 0% on Purchases and Balance Transfers for 14 months, and then the ongoing APR of 14.24% - 25.24% Variable APR. The annual fee is $0. Alternative pick: For credit cards with a similar rewards structure, also consider the Chase Freedom® and the U.S. Bank Cash+™ Visa Signature® Card. The latter even lets you choose your bonus categories from a list of several each quarter. Your local supermarket, department store or gas station may offer branded store cards, but the Blue Cash Everyday® Card from American Express could work out better for you when it comes to your everyday spending. It earns 3% back at U.S. supermarkets (on up to $6,000 per year in purchases, then 1%), 2% back at U.S gas stations and select U.S. department stores, and 1% back on other purchases. Terms apply. There’s even a welcome offer for new cardholders: Get a $150 statement credit after you spend $1,000 in purchases on your new Card within the first 3 months. Terms Apply. You’ll get some breathing room on interest, as the card offers a 0% intro APR period: 0% on Purchases and Balance Transfers for 15 months, and then the ongoing APR of 15.24% - 26.24% Variable APR. It’s a solid offer for an annual fee of $0. Alternative pick: The Blue Cash Preferred® Card from American Express, this card’s sibling, can offer an even higher rewards rate in these categories if you’re willing to pay a $95 annual fee. Rewards credit cards generally require good to excellent credit, but those with average credit could consider the Capital One® QuicksilverOne® Cash Rewards Credit Card. It earns an unlimited 1.5% cash back on every purchase, which is the industry gold standard. The main drawback is that the card has an annual fee of $39, so you’ll want to make sure you can earn enough in rewards to outweigh the cost of carrying the card. The card also offers no 0% introductory APR period, so it’s not ideal for financing large retail purchases over time. Alternative pick: If you have a thin credit history and want to avoid paying an annual fee, the Deserve® Pro Mastercard might be an option. It offers generous rewards rates: 3% cash back on travel and entertainment, 2% cash back at restaurants and 2% back on all other purchases. The annual fee is $0. The card’s bonus categories may not fit as well in terms of everyday retail spending, and like the Capital One® QuicksilverOne® Cash Rewards Credit Card, there is no 0% intro APR window. It’s not that retail store cards are all bad. Many have stepped up their overall value in recent years, and some can be quite rewarding, especially for brand loyalists. The Target REDcard™ Credit Card, for example, offers a 5% discount on a majority of Target purchases, both in store and online. Depending on how much Target shopping you do, a 5% discount on nearly anything at that store may beat a card that offers 1.5% back on all purchases everywhere. The annual fee is $0. A similar case can be made for the Amazon Prime Rewards Visa Signature Card, which offers potentially lucrative rewards not just at Amazon, but also at Whole Foods — and also at restaurants, gas stations and drugstores. That can make for a valuable everyday card, if you already pay annually to be a Prime member. And possibly most important, are the ongoing rewards categories compatible with your everyday spending? If not, a general rewards card may be worth exploring. Information related to the Amazon Prime Rewards Visa Signature Card has been collected by NerdWallet and has not been reviewed or provided by the issuer of this card. What is a secured credit card? How can I raise my credit limit? We want to hear from you and encourage a lively discussion among our users. Please help us keep our site clean and safe by following our posting guidelines, and avoid disclosing personal or sensitive information such as bank account or phone numbers. Any comments posted under NerdWallet's official account are not reviewed or endorsed by representatives of financial institutions affiliated with the reviewed products, unless explicitly stated otherwise. Disclaimer: NerdWallet strives to keep its information accurate and up to date. This information may be different than what you see when you visit a financial institution, service provider or specific product’s site. All financial products, shopping products and services are presented without warranty. When evaluating offers, please review the financial institution’s Terms and Conditions. Pre-qualified offers are not binding. If you find discrepancies with your credit score or information from your credit report, please contact TransUnion® directly.